In this chapter a summary review of the state of the art on theories of large-scale social conflict against a central authority is presented. The review will be centered on two theories, Ted Gurr’s frustration-aggression theory on the psychological factors of civil violence and Gene Sharp’s theory of non-violent action. The first is very systematic and identifies the key variables and mechanisms of positive and negative drive for large-scale protest and violence. The second is also important because of its connection with the “Arab Spring,” which will be analyzed in later chapters. 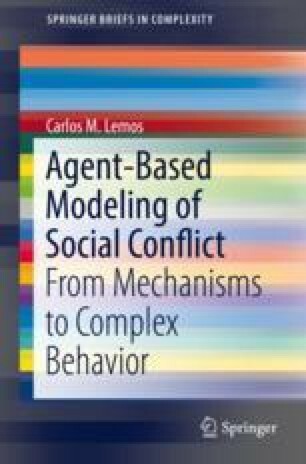 The chapter also includes some notes on the concept of legitimacy and concluding remarks on the implementation of social conflict theories in agent-based models.